What: A new line of mini figures that combines inspiration from classic lines such as M.U.S.C.L.E. 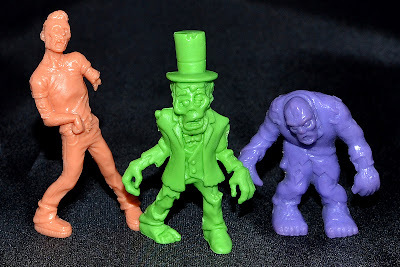 and Monster in My Pocket with modern day zombie mania. While Z.O.M.B.I.E. 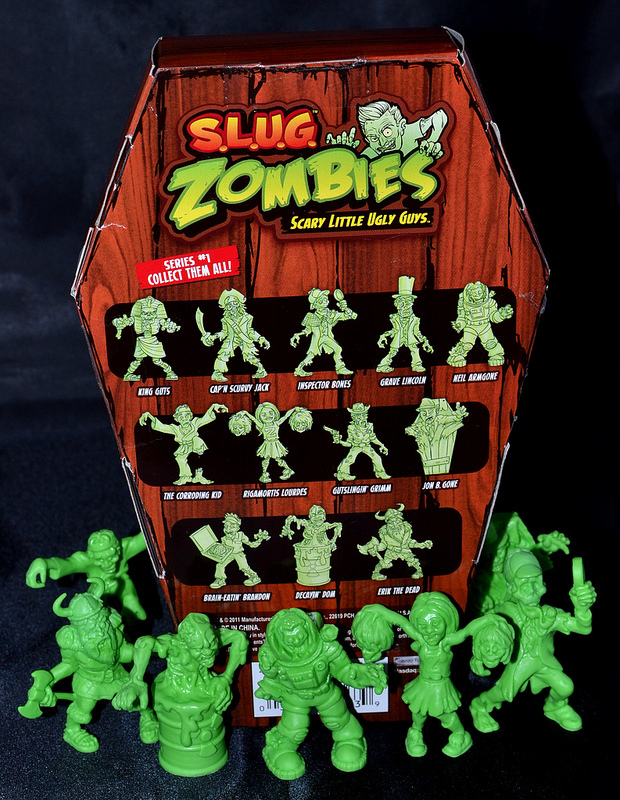 from October Toys got there first (along with the Zombie Planet set of vending machine figures), S.L.U.G.--which stands for "Scary Little Ugly Guys"--is a very exciting toy line for a few reasons: there are already 16 different sculpts released with plans for many more (including other creatures such as monsters and aliens); this is the first mini figure line of its kind to see mainstream release for some time; and quite simply, they're awesome! The 2" zombies are made out of a soft plastic that falls somewhere in-between the materials used for M.U.S.C.L.E. and M.I.M.P. and come in a fitting green color that looks great on display. They're sold in a few different formats, including coffin-shaped 12-packs and single-packs as well as three-packs. 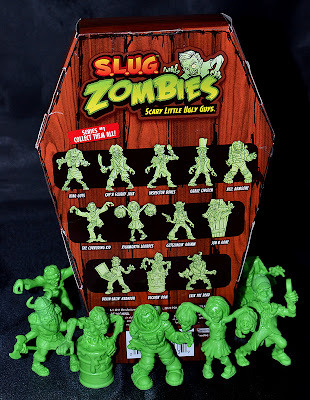 Instead of being just basic zombies, all of the S.L.U.G. 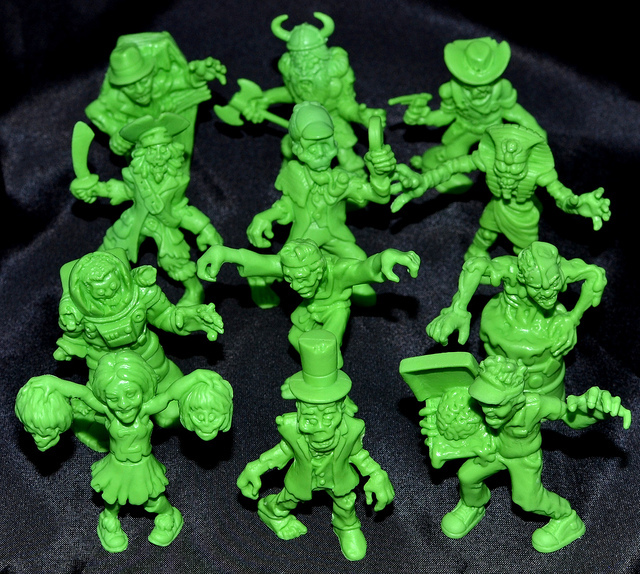 figures offer up a unique character--there's an astronaut zombie, a pirate zombie, a cheerleader zombie, and so on. This is a very cool toy line that will hopefully continue for a long time! When: The initial wave of 16 different figures began to appear in winter 2011. Where: So far available in the U.S. in certain Toys R Us stores. 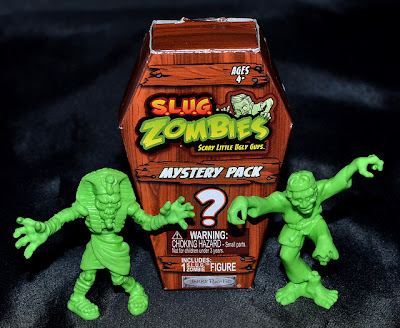 Single-packs have also been available in some Walgreens stores, and the JAKKS Pacific website also lists Target and K-Mart as retailers, although at the time of this post I haven't seen any reports of the toys being spotted at either. 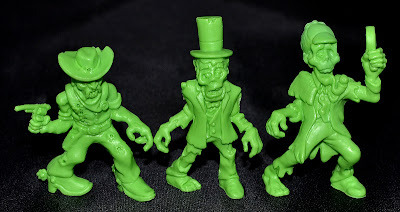 Who: Released by JAKKS Pacific, Inc.
Great photos and informative review. see how tall they are. Thanks for the comment, krakit. Glad you liked it! Only place I was able to get my hands on the 12 pack was at Toys R Us dot com. Have YET to find any singles or three packs ANYWHERE! Are you selling your series 1 set? My son is looking everywhere for it!! !